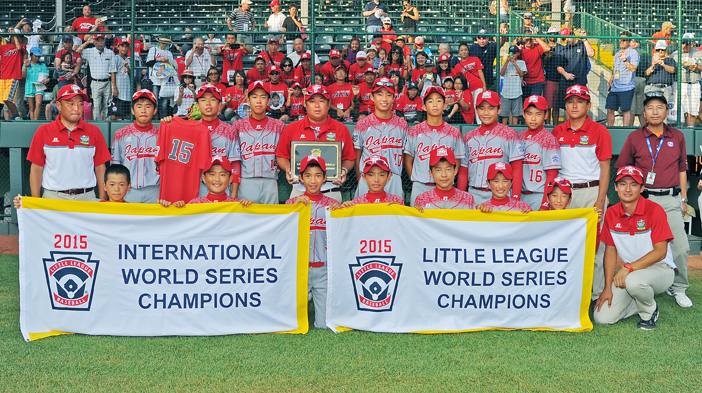 The kids from Tokyo win the title as Japanese baseball continues to dominate the world stage. I’ve spent a great deal of this season talking about the Japanese exodus out of MLB. After all, we are witnessing the lowest total of Japanese-born players since 2000. That fact can be attributed to a variety of factors — the lack of incentive for Japanese clubs to post their star players thanks to the collective bargaining agreement, the fact most of the established stars are aging themselves out, and the overly criticized free agent “failures” that have made some teams wary to pursue the Japanese market. But Sunday once again proved that Japan is a powerhouse on the world baseball scene. 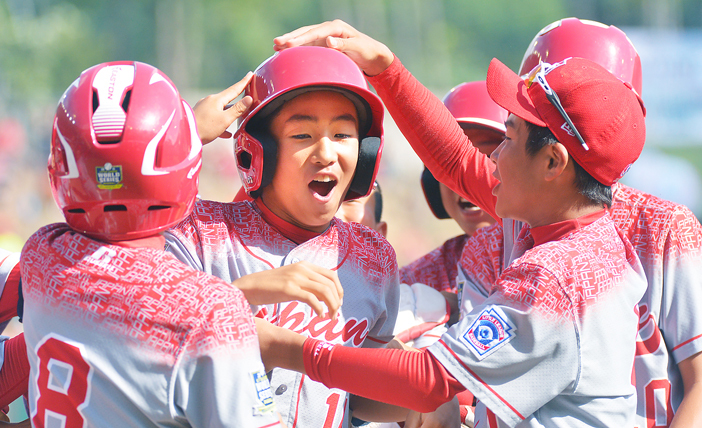 The Little League squad from Kitasuna, Tokyo went undefeated throughout the tournament and put on an offensive display against Lewisberry, Penn., in the Little League World Series championship game on Sunday, after falling behind by a 10-2 score in the first inning. “I told the players it doesn’t end until it ends,” said Japan manager Junji Hidaka after the game. Two innings later, they had a 13-11 lead before they tacked on five more runs in the sixth to win it, 18-11. It was a crazy offensive game as the Japanese team collected their 18 runs on 22 hits. Combined with Pennsylvania’s 11 runs on eight hits, the game set a Little League record for most combined runs scored and most combined hits recorded in a championship game. 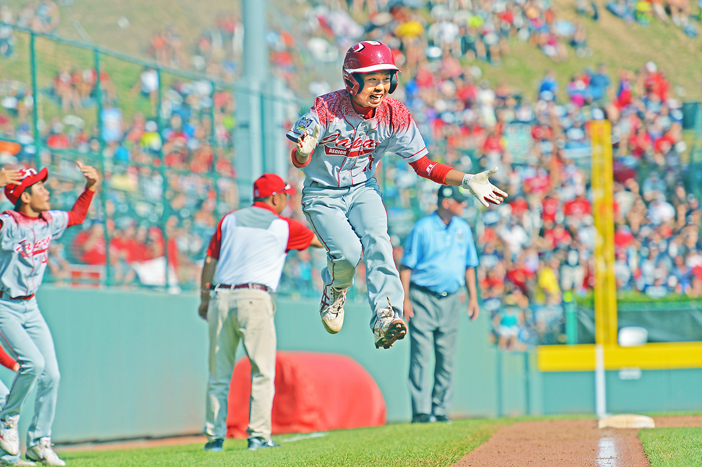 The eight-run deficit was also the largest overcome in Little League World Series history. Kengo Tomita is greeted at home plate after his second-inning home run. The next batter – Kengo’s brother, Shingo – hit the next pitch for the first of his two homers in the game. Japan’s victory puts an exclamation point on their total dominance of the tournament over the past decade. Since 2005, Japan has won the Series four times, finished runner-up three times, and taken third twice. Extend that back to 2000, and Japan has six titles and finished in the top three 13 of the 15 tournaments. What’s more, Japan won it all in 1999. Granted, the Japan team is a national team, while Pennsylvania is a state squad, but Pennsylvania didn’t have to navigate through the rest of the world’s all-star rosters to get to the finals. The U.S. always gets a representative in the final game, a fact that cuts both ways. There will be those that argue that the Japanese style of baseball is more conducive to tournament play as the men’s national team has also done well — winning two of the three World Baseball Classics and earning a silver (Atlanta 96) and a pair of bronze medals (Barcelona 92, Athens 04) in the Olympics — and has actually held some of the country’s stars back when they play stateside. But it could also be argued that baseball has drastically changed here in the States. Contact and plate discipline along with pitch location and control are more important than the sheer (assisted) power that fueled the game in the three decades preceding the twenty-tens. Japan showed they could win with small ball, beating Mexico 1-0 and Venezuela 5-4 with Japan’s last at-bat in each. They also showed they could flat out rake with the 22 hits in the final. That versatility and style is largely how the Japanese men’s teams won and it is how Major League players like Norichika Aoki and Jung Ho Kang have become valuable contributors on playoff-bound teams. Perhaps I’m wrong. Perhaps in the next few years, we’ll see another massive influx of Japanese-born players, many of them who got their start on the biggest little stage in the world. Notes: Sunday’s win marked the 10th LLWS championship for Japan, and its fourth in a six-year span. It is the third title for a team from Kitasuna, after winning in 2001 and 2012. Taiwan leads all countries with 17 championships.